On 3rd November 1755, the day after her birth, the little Archduchess Maria Antonia Josefa Johanna von Hapsburg of Austria, Alsace and Lorraine was baptised. Her first name, which she shared with all the Hapsburg Princesses, was given in honour of the Virgin Mary, for whom the family had a particular veneration. Her other names were given in honour of Saint Anthony (one of the patron saints of Portugal), her godfather Jose, King of Portugal, and Saint John The Evangelist. The ceremony took place at noon in a beautiful and recently-built ante-camera in the Church Of The Augustine Friars, which was the traditional church used by the Austrian court. 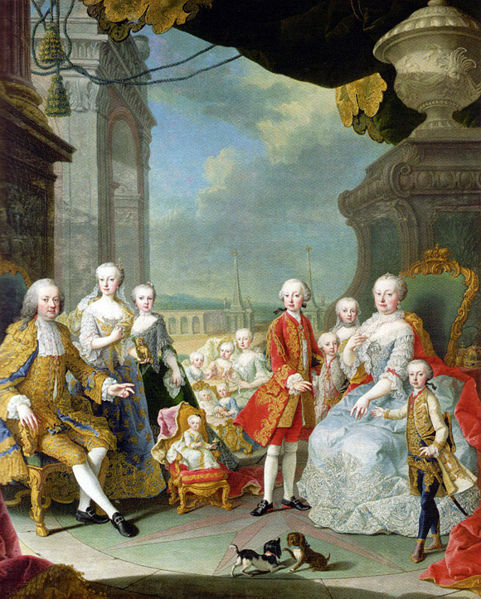 The entire Imperial family, with the exception of the mother, the Empress Maria Theresa, who was recovering from the birth, sat in the front pew, looking on as the Archbishop of Vienna, Cardinal Von Trautson performed the ceremony. Usually, it was the Papal Nuncio who baptised the Imperial children. But because the new Nuncio, Cardinal Visconti, hadn’t been formally presented at court yet, that wasn’t possible. The baby’s godparents were the King of Portugal Jose and his Queen, Mariana-Victoria of Spain, who obviously weren’t present at the ceremony. At the time, royals weren’t expected to travel such distances to be present at a baptism. The baby’s eldest siblings, Joseph and Maria-Anna, were appointed proxies for the royal couple. Although it was not known at the time, the King and Queen of Portugal had been forced to flee their capital, which had been devastated by an earthquake, just the day before. When news reached Vienna, superstitious people considered it a bad omen for the future of the little Archduchess. However, this was a day for celebration in Austria. A gala was held later in the day to celebrate the birth and a few more took place in Vienna and other important cities of the empire, such as Prague, in the following days. But because Marie Antoinette was only the last daughter to be born in a very big family, these celebrations were toned down and not particularly extravagant.